When Astell & Kern introduced its first product, the $699 AK100, skeptics said that, in a world of smartphones and $15 earbuds, it would never succeed. To the consternation of naysayers, the AK100 proved there was a substantial market for an elegant high-end portable player. To add to an audiophile's portable player options, Astell & Kern has gone even further with its latest offering: the $1,299 AK120. What does the AK120 bring to the table to command such a price tag? How about more technical refinement, greater storage capacity, and more functionality? • Read more reviews of media players in from HomeTheaterReview.com's writers. • Explore more reviews in our Headphone Review section. To a casual observer, the AK120 looks almost identical to its older sibling, the AK100. When you put the two players next to each other, however, you see that the AK120 is approximately 0.5 inches taller and has protection ridges around its slightly thicker volume knob. The AK120 also comes with a very nicely made leather case that fits snugly over its semi-gloss black metal chassis. This case isn't merely a $5 cheapie. I bought a similar case for the AK100, and it cost over $80 on eBay (the only U.S. source I could find!). The AK120 supports a variety of digital formats and resolutions, including FLAC, WAV, WMA, MPR, OGG, APE, AIFF, ALAC, APE, and 64x DSD. Playing time varies depending on the file resolution. For MP3s, playing time is as long as 14 hours but, when playing high-res files, you can expect the battery life to drop some. The AK120 comes with iRiver's Plus 4 software for use with Windows XP, Vista, and Windows 7 computers. This software makes moving music between your computer and the AK120 relatively easy and more intuitive than dragging and dropping files into folders. If you plan to use a lot of 96 kHz, 192 kHz, or DSD music files, transferring them will be a lengthy process time-wise. The AK120, just like the AK100, supports streaming from supported Bluetooth 3.0 devices, such as an Android or iPhone when they are within a 20cm range. When a phone call comes through, the AK120 will automatically disconnect. While the Bluetooth connection will support higher-resolution files, the AK120 instruction books cautions that "high-quality" music files over 48 kHz may "slow down the products," so, to ensure optimal stability, 48 kHz and lower files are recommended for streaming, but files below 32 kHz are not supported by the Bluetooth protocol used by the AK120. Inside the AK120 you'll find not one but two Wolfson WM8740 DAC chipsets. Each WM8740 is dedicated to a single channel, unlike the AK100, which uses one of these DAC for both channels. The dual-chip arrangement gets the AK120 an 8dB better crosstalk specification, 40 ps less jitter, and 3dB more signal-to-noise than the AK100. Controls on the AK120 consist of a volume knob sticking out of one side, three small buttons on the other that control play/pause, previous/rewind, and next/fast forward, and, on the top edge, a small button that functions as a volume lock once it has been activated. All other functions are adjusted via the AK120's touchscreen LCD display. The display contains multiple nested menus that keep a majority of the most-used controls on the main screen, but there is one adjustment that is buried four levels down called the "Volume Lock," which most users will want to activate almost immediately; without it, there's no way to ensure that the volume (and other controls) won't be accidentally activated while the player sits in your pocket. Among its features, the AK120 offers two kinds of equalization. First there's "Pro EQ," which is a fixed equalization setting "recommended by expert" according to the AK120 owner's manual. No other info is available in the guide on what this EQ is actually doing. There's also a five-band equalization screen that offers up to 10dB plus or minus corrections at 62, 250, 1000, 4000, and 16,000 Hz. The EQ is meant primarily to correct for earphones that need help in some part of the frequency spectrum, but it can also be used to correct for a particular album or track's harmonic issues. For purists, the EQ function can be completely bypassed, which will also result in a slightly higher output level. My only criticism of the EQ is that the AK120, just like the AK100, lacks any EQ save-and-store functions, so you can't keep multiple EQ settings, such as one for each headphone you use regularly. Every time you change to a pair of headphones that requires new EQ adjustments, you must go into the EQ settings and change each of the five bands manually. Features that differentiate the AK120 from the AK100 include the ability to hold 192 gigabytes of music, compared with the AK100's original specification of only 96 GB. The AK120's internal memory holds 64 GB, compared with the AK100's 32. Also, the AK120 supports two microSD cards up to 64 GB. When introduced, the AK100 only supported 32GB cards, but its latest firmware update brought its capabilities up to 64 GB (as well as adding gapless playback.) 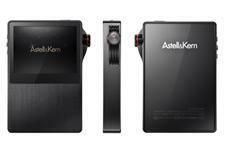 One of the primary reasons prospective owners would choose the AK120 over the AK100 is its USB DAC capability. Its Wolfson WM8740 chips can be used for digital-to-analog duties by merely connecting the supplied USB cable between your computer and the AK120, designating the AK120 as your default audio device, and playing music. The AK120 is a fully compliant USB 2.0 device that won't need any special drivers for Mac or PC operating systems. When used as a USB DAC, the AK120 supports files from 44.1/16 all the way up to 192/24 PCM and 64x DSD (if your computer's playback software supports 64x DSD). The AK120 can also serve as a DAC for SPDIF sources, such as CD transports. It has provisions to accept a Toslink input and has a Toslink output that can be used if you want to send a digital stream to another DAC. The only time the digital output is not active is when the AK120 is being used as a USB DAC, which is too bad, since it could be used as a USB-to-SPDIF converter if it remained active. Accessories included with the AK120 include a special USB cable for docking, charging, and transferring files (don't lose this, as all the third-party cables I tried with the AK120 did not deliver full functionality when connected to my Mac), plus a quick-start guide, warranty info, an extra plastic screen and back protectors, an Italian-made custom leather case, a high-resolution music sampler from HDTracks.com in its internal memory, and a black cloth bag to prevent scratches on the AK120 during transit. The packaging is slick but not overdone, featuring a matte-black box that slides into an outer sleeve. The AK120, unlike many "premium" products, doesn't waste money on over-the-top display boxes or unnecessary frills. Read more about the performance of the AK120 on Page 2.